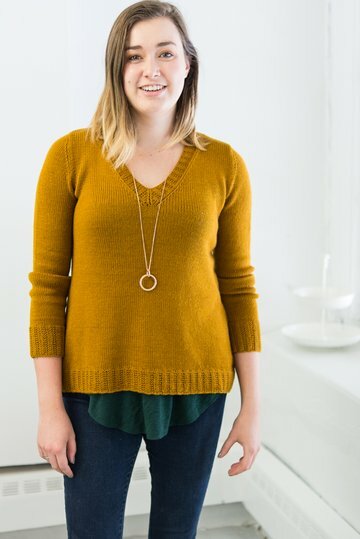 The Spruce Point Pullover was designed for my spring 2018 "Remarkable yarns" collection; a series of accessories and garments designed both to coordinate with one another, and to work equally well in either of two very special yarns: Rosy Green Wool Cheeky Merino Joy and Crave Yarn Caravan. Like many CustomFit patterns, Spruce Point Pullover is available in any silhouette, fit, and sleeve length combination you like. (It's shown here on Christy with a close fit, worked up in Caravan (color Magisterium) and an a-line silhouette, with a long sweater length and long sleeves.) This garment will work well with a huge variety of yarns, but I definitely recommend the two I've chosen. 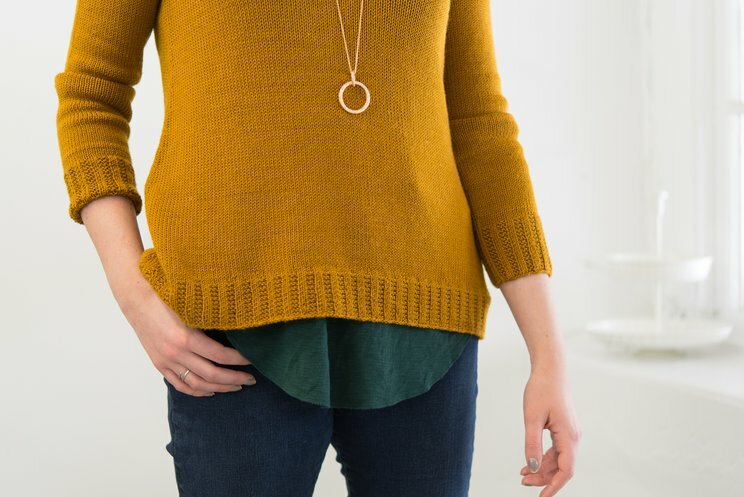 The Cheeky Merino Joy will make a soft, plump, warm fabric with a matte look and less drape. Caravan will make a soft, more lustrous fabric with more intense color and drape. You can't go wrong with either of them. A-line version shown in Crave Caravan, a lustrous, intense, and super-soft wool-silk-camel-cashmere blend. Shown in color "Magisterium". 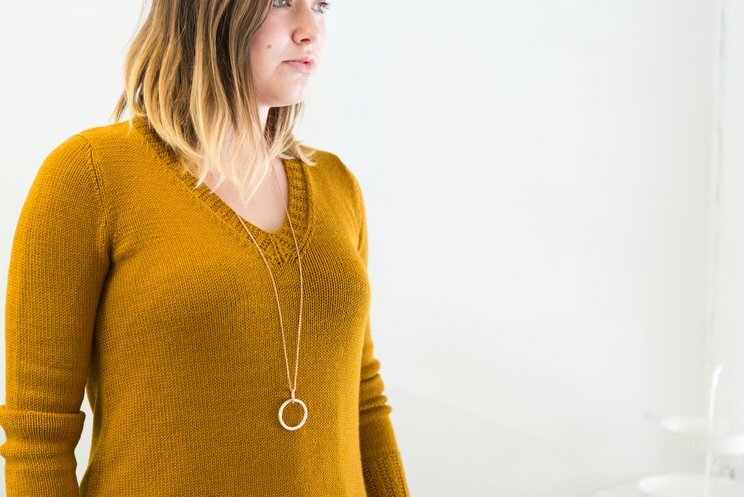 This sweater was also designed to work well with the soft, ecologically-responsible, and great-to-wear Rosy Green Wool Cheeky Merino Joy. You can find both yarns at Yarn Culture. For a standard size 30 (32, 34, 36, 38, 40, 42, 44, 48, 52, 56, 60)’' / 76 (81.5, 86.5, 91.5, 96.5, 101.5, 106.5, 112, 122, 132, 142, 152.5) cm you'll need 4 (4, 4, 4, 5, 5, 5, 6, 6, 7, 7, 8) hanks of either of these two yarns.